The Lions suffered a third successive defeat overseas as the Highlanders claimed a deserved 39-27 victory in Dunedin on Saturday. CRAIG LEWIS reports. The Lions certainly didn’t lack any courage during this contest, but they were ultimately no match for a tactically-astute home side that took the game to their opponents, and came up trumps. It’s a result that ends a forgettable tour to Australasia for the Lions, who are left clinging onto an eight-point lead at the top of the South African conference, while knowing that it is likely to be reduced further once Saturday’s matches are completed. 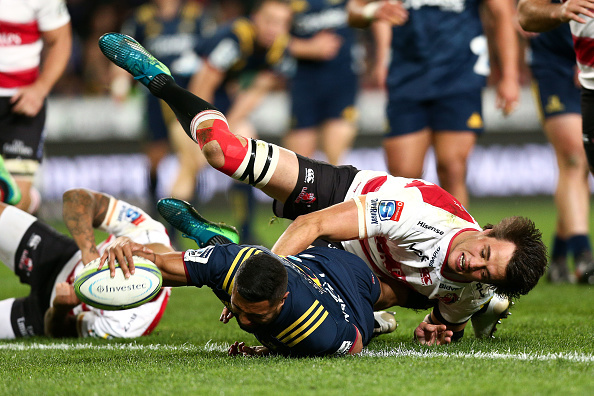 Although the Highlanders are renowned as a team who are only too happy to put boot to ball and play without possession, they surprised the Lions with a clear change in tactics during the opening half. Fully aware that the Lions were at the end of a taxing four-week tour, the Highlanders played with plenty of width and ball-in-hand intensity, while their linespeed on defence was outstanding. It left the Lions looking rattled as they fell 14-3 behind after tries to Lima Sopoaga and Liam Coltman in the opening quarter, and matters only went from bad to worse when Luke Whitelock added another five-pointer in the 35th minute. That was a score that looked likely to kill off any of the Lions’ remaining resolve, and yet in a frenetic final five minutes of the half, the Johannesburg-based side scored twice through Harold Vorster and Robbie Coetzee, which remarkably cut the deficit to just four points. Soon after the restart, the Highlanders struck back when Waisake Naholo finished off a beautifully-worked try, but the Lions continued to gain good reward from their lineout drive, which enabled Coetzee to dot down for his double minutes later. However, there was always a sense that the Lions were fighting a losing battle as the Highlanders looked threatening each time they took the ball to the line. In the context of the clash, the hosts struck the crucial blow when Tei Walden went over for his side’s fifth try in the 64th minute. The Lions briefly threatened another fightback when Marnus Schoeman scored late in the game, but two late penalties to Sopoaga sealed the result. Highlanders – Tries: Lima Sopoaga, Liam Coltman, Luke Whitelock, Waisake Naholo, Tei Walden. Conversions: Sopoaga (4). Penalties: Sopoaga (2). Lions – Tries: Harold Vorster, Robbie Coetzee (2), Marnus Schoeman. Conversions: Elton Jantjies (2). Penalties: Jantjies. 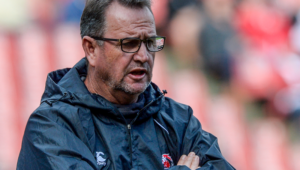 Lions – 1 5 Andries Coetzee, 14 Ruan Combrink, 13 Lionel Mapoe, 12 Harold Vorster, 11 Aphiwe Dyantyi, 10 Elton Jantjies, 9 Nic Groom, 8 Kwagga Smith, 7 Franco Mostert, 6 Cyle Brink, 5 Marvin Orie, 4 Andries Ferreira, 3 Johannes Jonker, 2 Robbie Coetzee, 1 Dylan Smith.